Vegan lipsticks from Aromi Beauty. Did the one day of 70 degrees get you in the spirit of spring? You’re not alone. 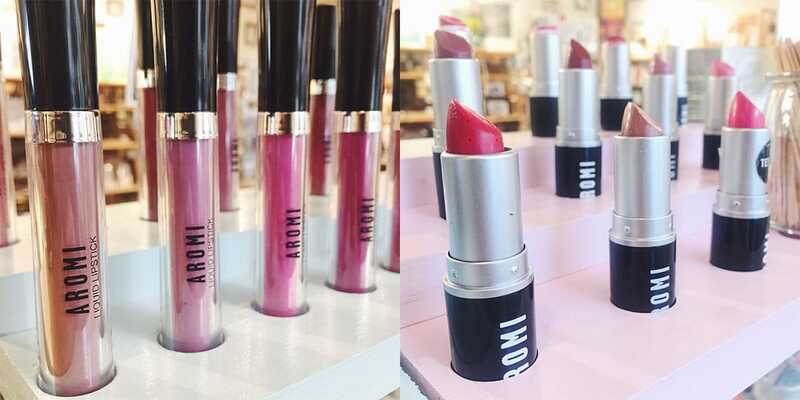 On today’s ICYMI blog, we’ll show you all the things we’re thinking about for spring (like those bright lipsticks above from Aromi Beauty). Speaking of spring… the bright colored pillows from Ribbon + Roving have us ready to go flower picking! And each pillow has that cute hedgehog print on the back! Indulge in floral soaks and succulent scrub downs with our handmade bath and body collection. 407 Botanicals Floral Bath soak is infused with Bulgarian rose petals, lavender, and sweet orange. Impurities are drawn out of the body with pink Himalayan and Mediterranean sea salt. Oatmeal and baking soda leave your skin clean and supple. 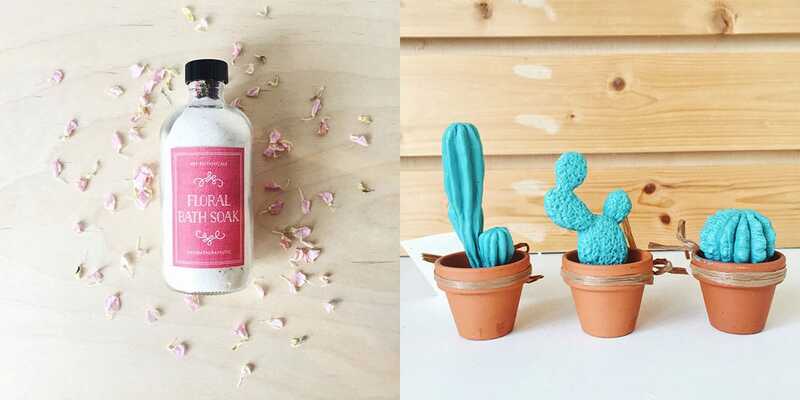 No, those succulent soaps aren’t just for looking cute in your bathroom (but we get it, #shelfie). Made with all natural ingredients like coconut oil, goat’s milk, and oat protein, those cacti will do everything but prick you. Does your home need some sprucing? 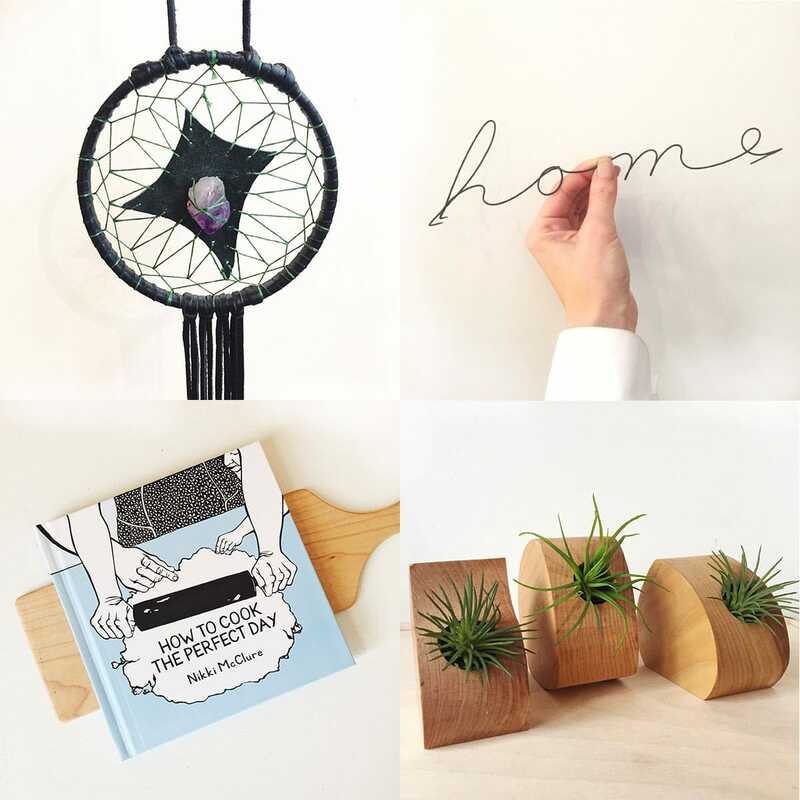 Find inspiration (and that missing piece) from our home goods and pottery section! 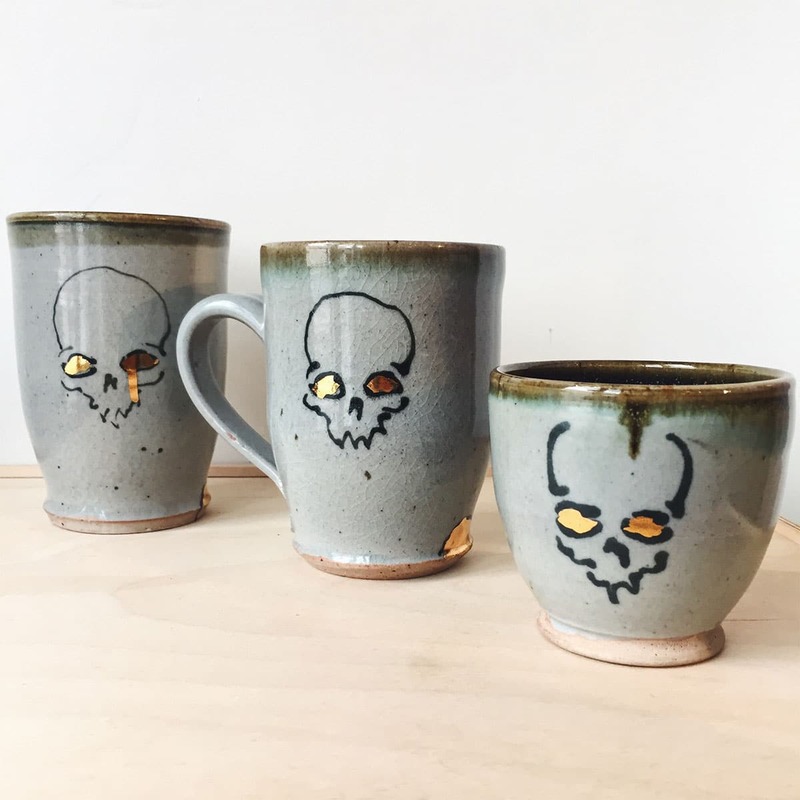 Whether you’re looking for a crystal dreamcatcher, trendy air plant holder, or locally-made skull mug, we got you. We’re ready for those pastels! Peach and periwinkle bunnies from Happy Grey Skies pair nicely with the egg tangram puzzle from Tree Hopper Toys. -Easter is just around the corner! And we’ll be sad to see that new painting from Randi Ford Art and Design leave our sales floor. It gives us all the feelings. We’re hot mess monsters by the end of the week. Patches and Pins, Oh My! Restock from one of our favorite vendors has arrived! 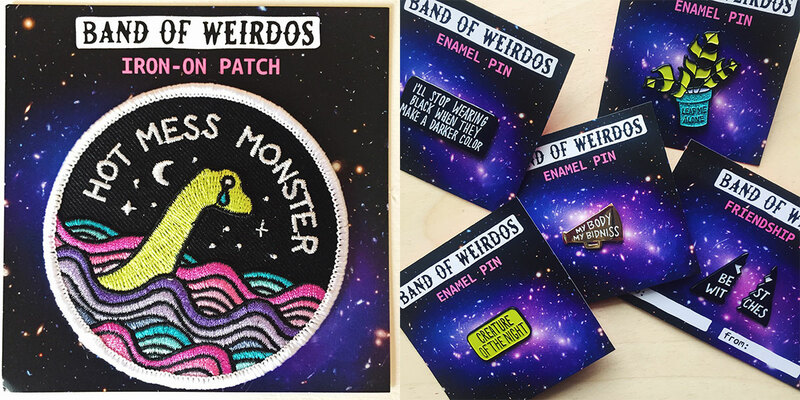 Band of Weirdos is an all snark, no bite, edgy-boss-babe business featuring pins, patches, and more. Come get ’em while they’re hot! This Mr. Sogs creature matched Mark’s vest so well, that we just had to take a picture. Aren’t they the cutest? Spring displays are happening in store! That concludes this week’s ICYMI! 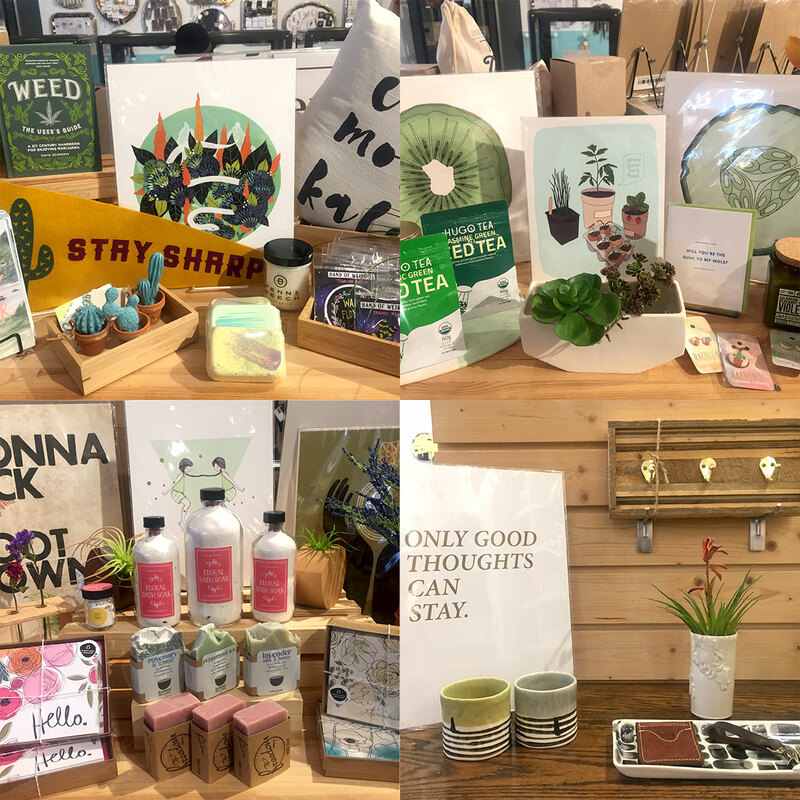 Keep thinking spring thoughts and we hope to see you in store soon! 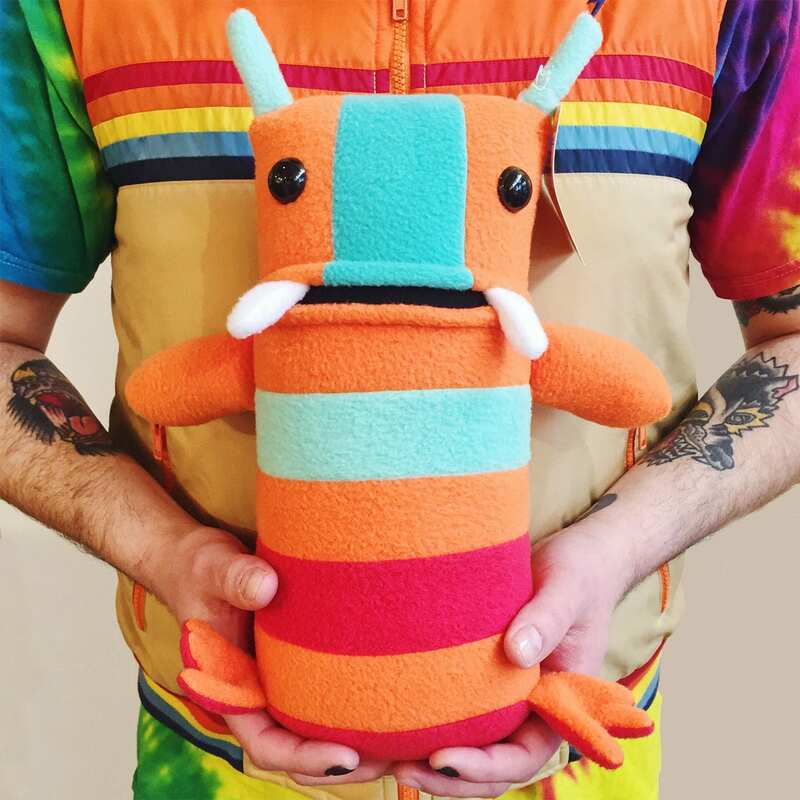 INDIEana Handicraft Exchange 2018 Vendor Application Now Live! Mark your calendars – we’re bringing you even MORE contemporary craft in 2018! Our annual summer show will be held on Saturday, June 16th at our regular venue, the Harrison Center for the Arts, from 12pm-8pm. Our Vendor Application for our 2018 Summer Show is now live and may be accessed directly on our site by going to our Vendors page. Click on the Application button and complete the form in full. Applications for the June 16 show will be accepted through midnight on Saturday, March 17. This is a juried event, meaning all applications will be accepted during the 6-week application window, then all apps will be separated by product category and ranked by an assembled jury of local artists and creatives. For more information, head to our FAQ page here. Join us for a summer afternoon filled with contemporary craft, live music, food trucks, ice cream, beer, and cider on Saturday, June 16th from 12pm-8pm! We’ll have over 100 vendors slingin’ their handmade goods and you can enjoy music from The Independent Music & Arts Festival which is held on site the same day as our summer show at The Harrison Center for the Arts. Admission is always free to our patrons and the event is family-friendly and open to all ages. The first 100 customers in line at the event who check in with their Yelp! app will receive a FREE SWAG BAG full of goodies, discounts, and more from our presenting sponsors and vendors! Don’t forget, like always, we’ll also be accepting donations for Coburn Place and Project Home Indy during our summer show! Bringing in donations gets you FREE RAFFLE TICKETS to win prizes during the show! Needed items include: household paper products, baby diapers, cleaning supplies, laundry supplies, trash bags, household linens, lightbulbs, body wash, adult pain relievers, IndyGo bus passes, instant oatmeal, coffee, granola bars, pillows, and batteries. Thank you for your continued generosity Indy! For more information about our summer show, visit our FAQ page here. Valentine’s Day has come and gone, but on this week’s ICYMI blog, we’ll show you how you can treat yo’self post holiday! And what better way to treat yourself than by buying a new handbag? 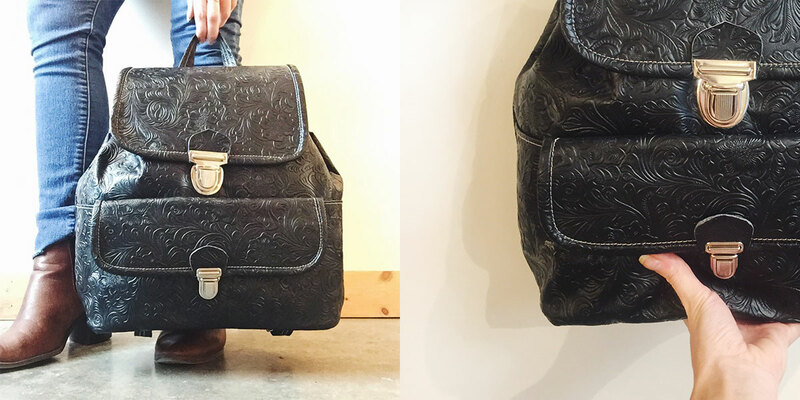 Check out that printed leather backpack above from local makers MH Leathergoods! Stylish, functional, and large enough to fit your tablet, notebook, and camera for all your 2018 adventures. 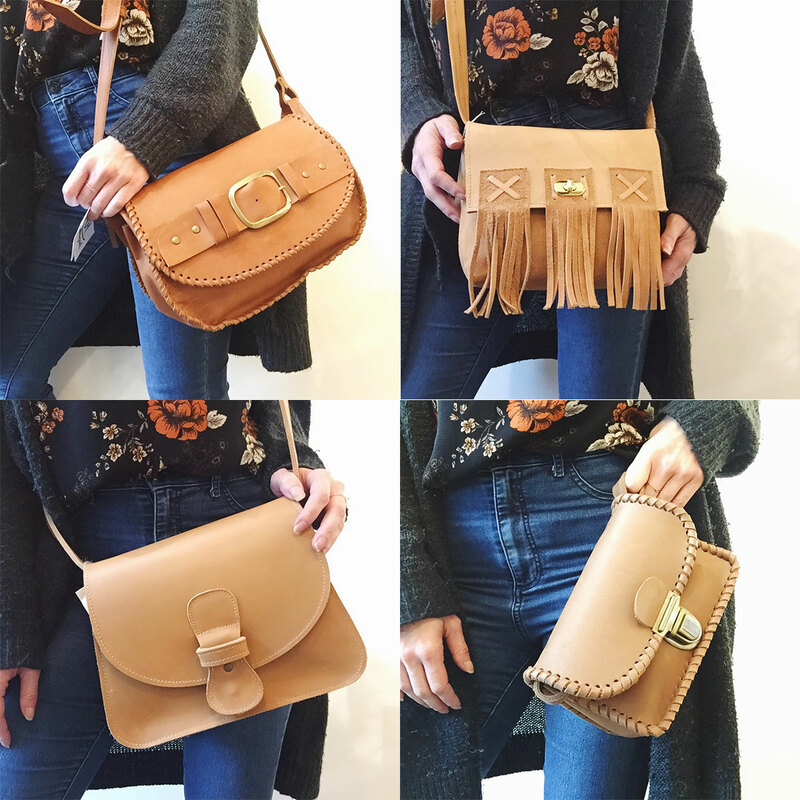 Obsessed with the camel leather trend like we are? Well, MH Leathergoods has you covered there too. Look at the selection below. From fringe, to studs, to buckles, you can’t go wrong with any of these selections for spring! We’ve been restocked from sought-after maker, LM Products. 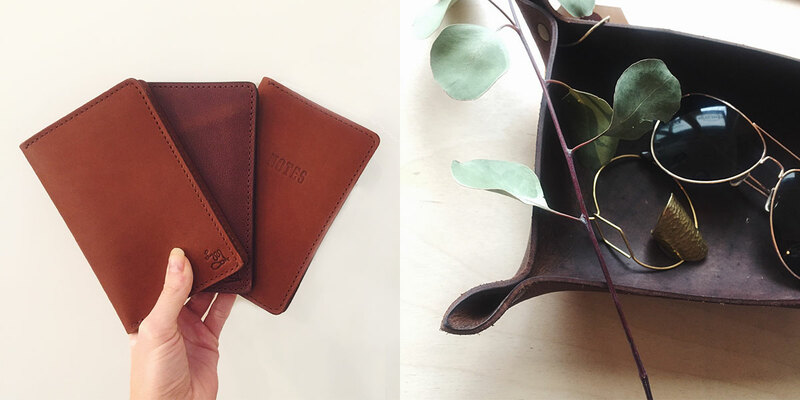 Find his leather trinket trays, notebooks, and leather handled travel jars on our shelves now! Hop on that plant train! While we don’t sell plants (yet), we do sell some beautiful planters that can help up that green game in your home! Above planters from Tandem Ceramics, Art by Jen F, Mod CRMX, and Elizabeth Suellentrop. To see what would work best for that Instagram worthy #shelfie, come see all the displays we’ve put together with our faux plants in store! 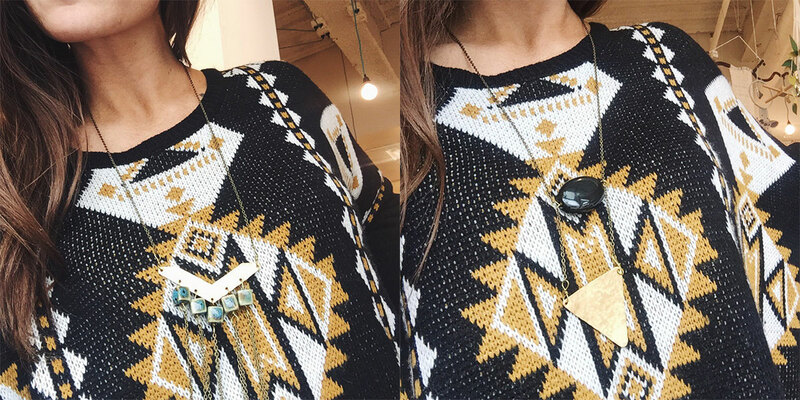 If you haven’t seen this trendy line, then you haven’t been in our store enough! 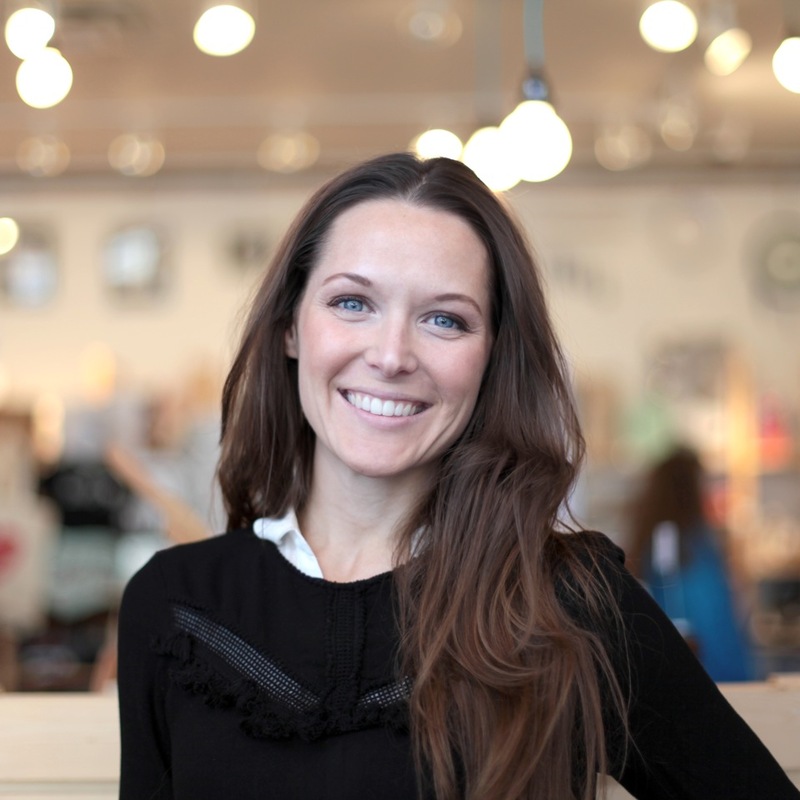 Oceanne is a Midwest maker inspired by her French heritage. The raw brass mixed with turquoise, marble, and minimal accents reflects her transition and love of countryside living to her now urban lifestyle. 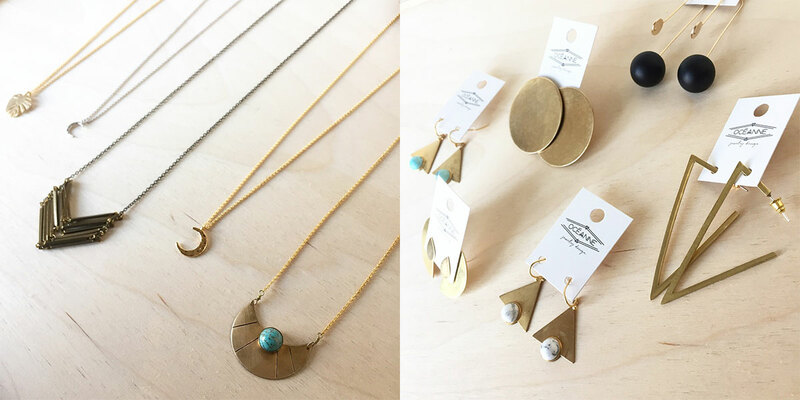 From hammered brass statement rings, to minimal lariat necklaces, to triangle earrings, her line is perfect for day to night wear! Come see for yourself! 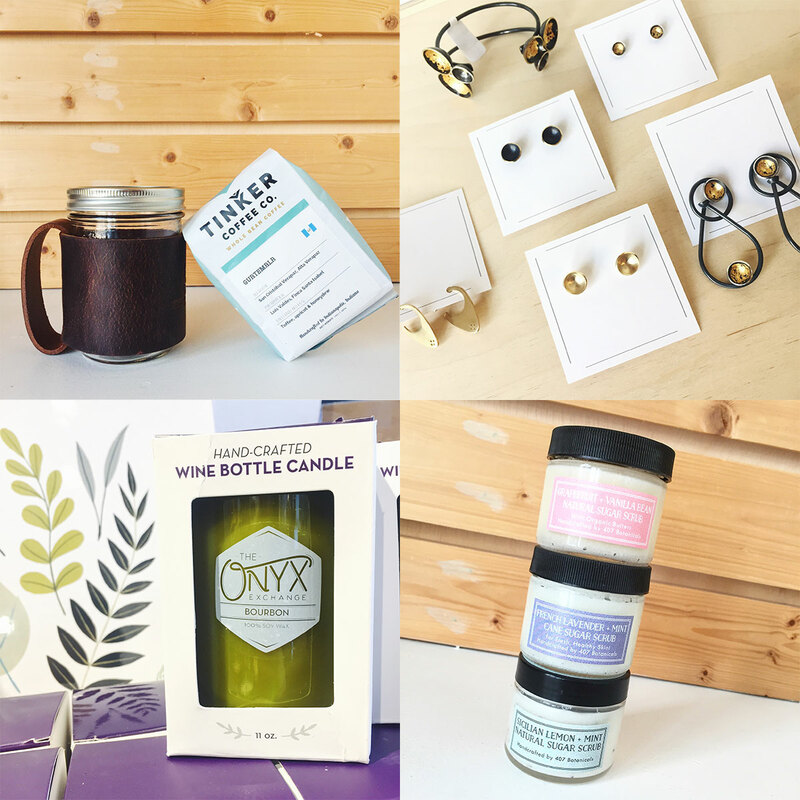 Even more ways to treat yo’self: Leather handle mug from LM Products, coffee from Tinker Coffee, jewelry from Fulcrum Jewelry, Onyx Exchange candles, and scrubs from 407 Botanicals. 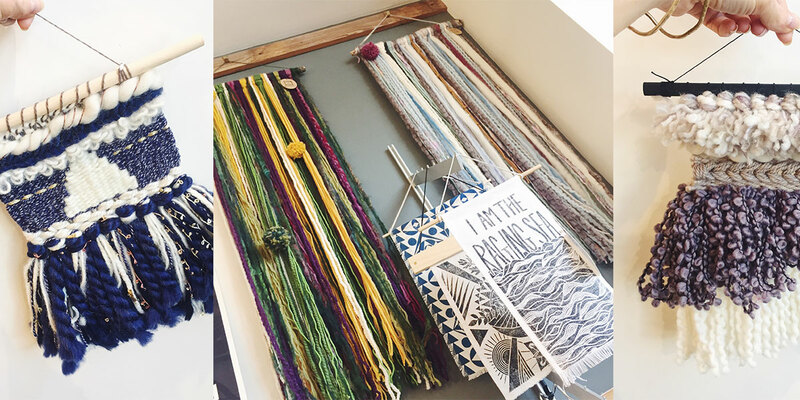 Local weaver Ribbon + Roving has restocked us with some little beauties and some even larger ones now! 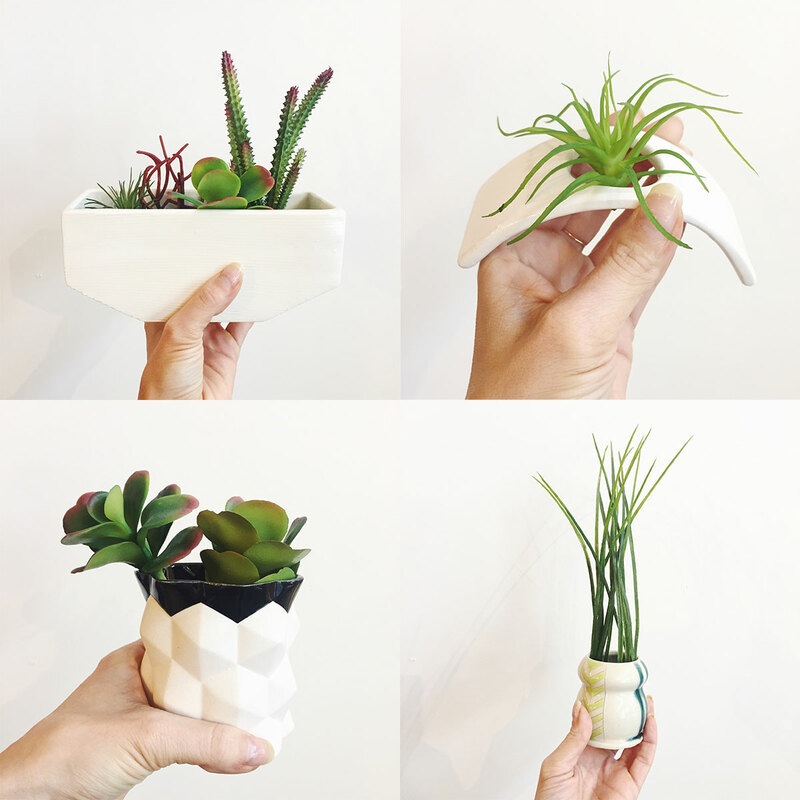 How cute would these look next to your new ceramic planter? Come pick one or three up soon, as they never last long! Having a late Valentine’s Day this weekend? We still have these beauties available in store! Rings from Oceanne Jewelry, hanging air plant holder from Elizabeth Benotti Ceramics, perfume from Aromi Beauty, and mini cards from Haven Paperie. It was surely a Happy Valentine’s Day for us! 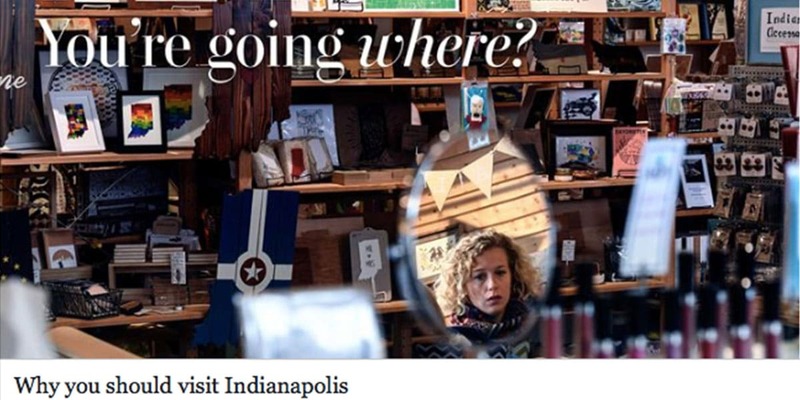 The Washington Post wrote up a beautiful piece on why you should visit our amazing city! We were mentioned along with some of our outstanding neighbors on Mass Ave. Read the full article here. Thank you Washington Post! Always Wanted to Work with Us? Well, it’s your lucky day! 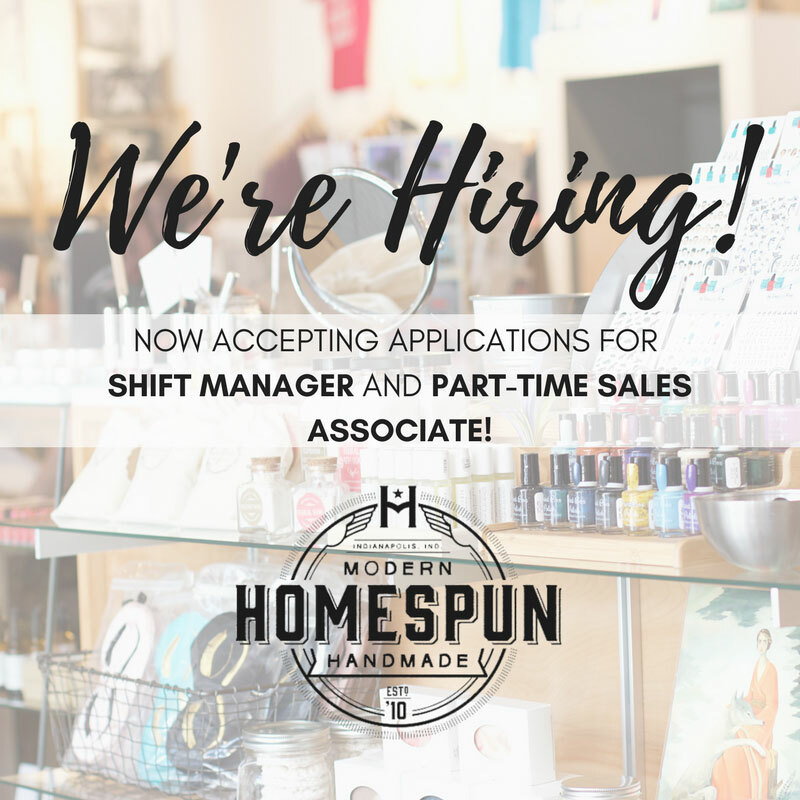 We have openings for a part-time Sales Associate and near-full-time Shift Manager. Read more about our openings and how to apply here. We look forward to receiving your submission! That’s it for this week’s ICYMI blog! We hope to see you this weekend for some treat-yo’self-shopping! We’re open Friday and Saturday from 10am-9pm, and from 11am to 6pm on Sunday! Free parking behind our shop on the weekends! Have a happy handmade day! Countdown: 3 days until Valentine’s Day! And whether you’re searching for that big gift, or want some add-ons, we’re bringing all the options to you in this week’s edition of our ICYMI blog! Who doesn’t love temporary tattoos? Skip the big store brand and shop our selection of Tattly in store. From beautiful watercolor florals to traditional black outlines, these are perfect to slip into that Valentine’s Day card. 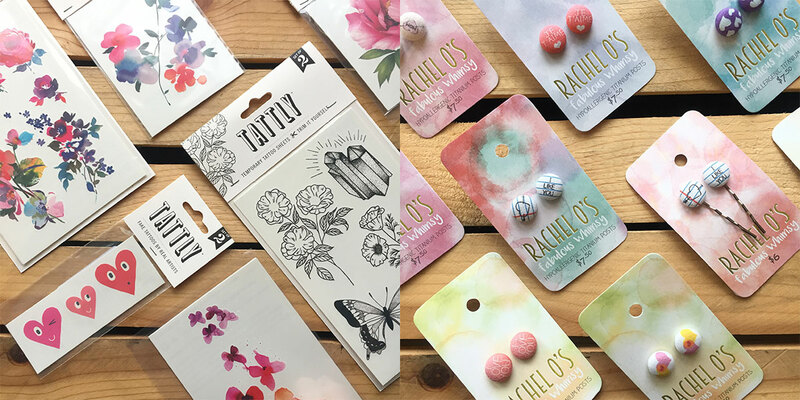 Button earrings and hairpins from Rachel O’s Fabulous Whimsy make for a great jewelry choice for the kiddos. We even have love and heart printed ones -so right for this occasion. If you ask us, getting a gold feminist button for Valentine’s Day is just as badass as any other piece of jewelry. And we’re pretty sure your lady would feel the same. Check out all the button and patch options from 1606 Supply Co. in store today! Have a kitty cat, plant loving person in your life? Then those ceramic kitty planters from Muddy Heart were made for you (to give to that person). The unicorn bath bombs from Pure Grace Soap have been restocked in store and we can see some little girls squealing over those when they open them on Valentine’s Day. Not that having the sniffles is romantic over Valentine’s Day, but putting together a sweet care package to make them feel better definitely is! 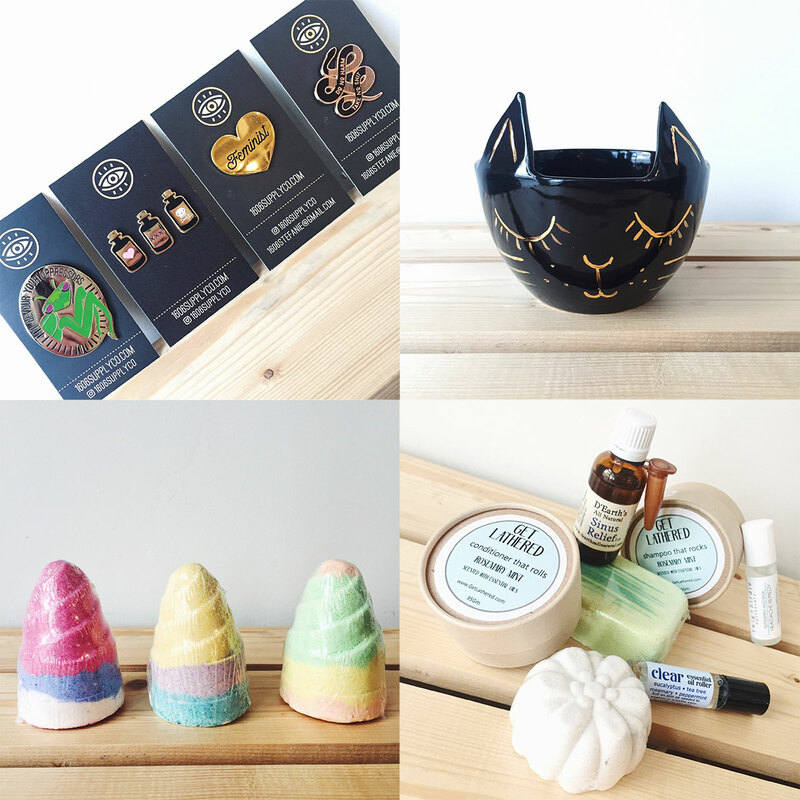 Shop our entirely handmade bath and body line full of soothing remedies to help your SO get through this cold season! 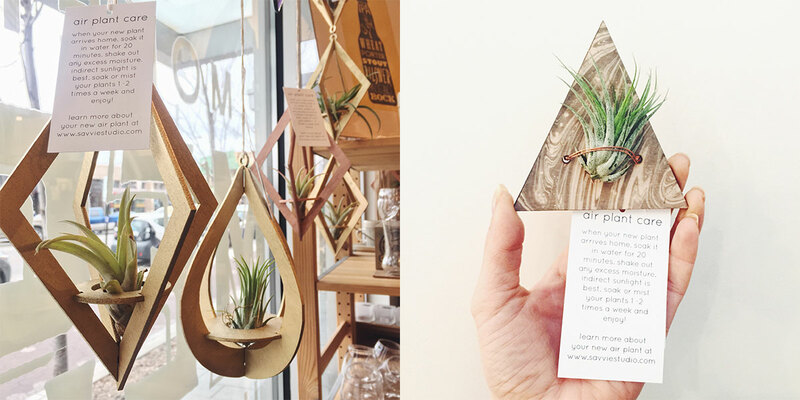 Wooden air plant holders and marbled air plant magnets from Savvie Studio. 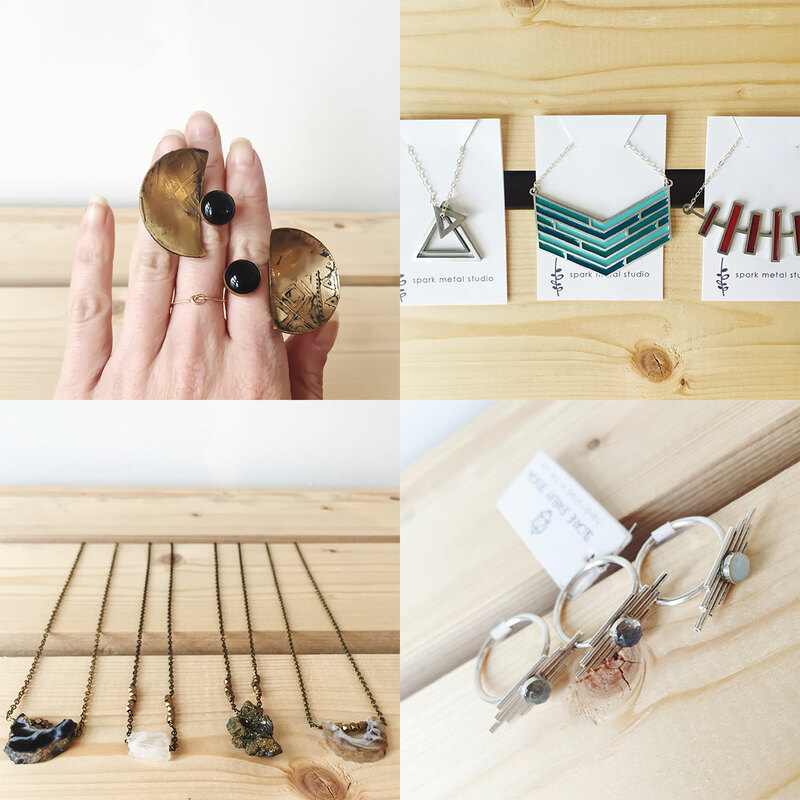 Eclipse rings from Redbud Jewelry, necklaces from Spark Metal Studio, geode necklaces from Grey Theory Mill, and resin rings from Sloane Jewelry Designs. From gemstones to metalwork to resin, we guarantee you’ll be able to find something for your Valentine from our handmade jewelry collection! And we offer free gift wrapping in store, so your gift will look just as good going home as it will on your significant other. 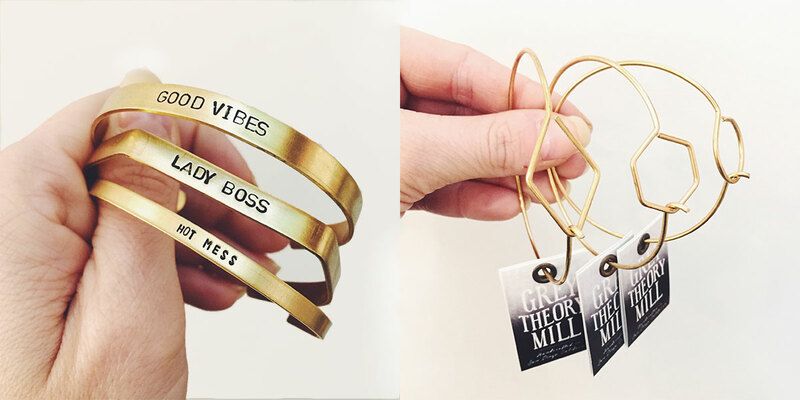 New stamped bracelets and geometric minimal bangles from Grey Theory Mill! Geometric statement necklaces from Nice Lena are sure to wow her on Valentine’s Day! 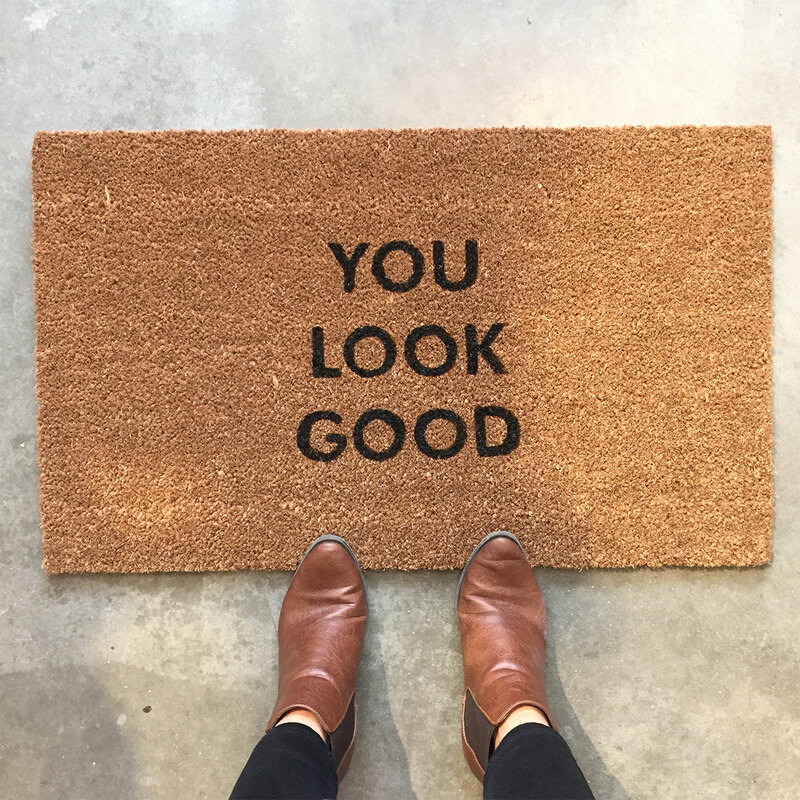 Check out this new rug from Laura Jane Handmade Co.! We wouldn’t be mad about receiving this for Valentine’s Day. It’s pretty much like a giant card! The beard laden men in your life will rejoice over our beard oils, balms, and waxes from popular vendors like Weatherbeard Supply Co., Circle City Beard Co., Scodioli, and more. 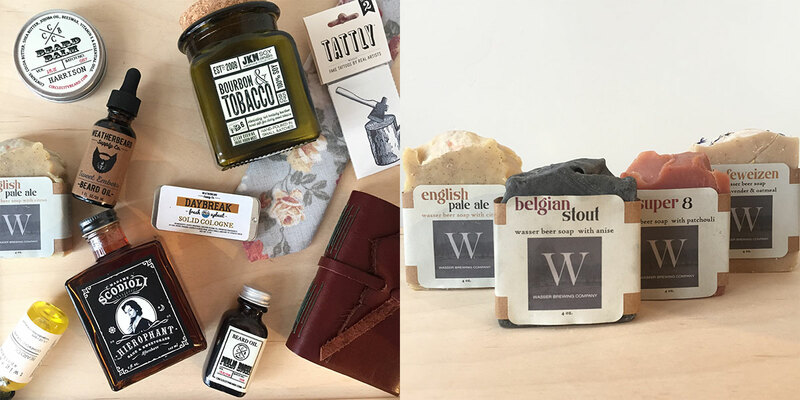 Pair that beard care with a beer soap from Teehaus and you’ll have one happy lumberjack. Looking for something outside of bath and body for your boy? Check out our amazing selection of ties and bowties, leather journals, and musky scented candles in store. We have something for every type of Valentine. Don’t forget the card! 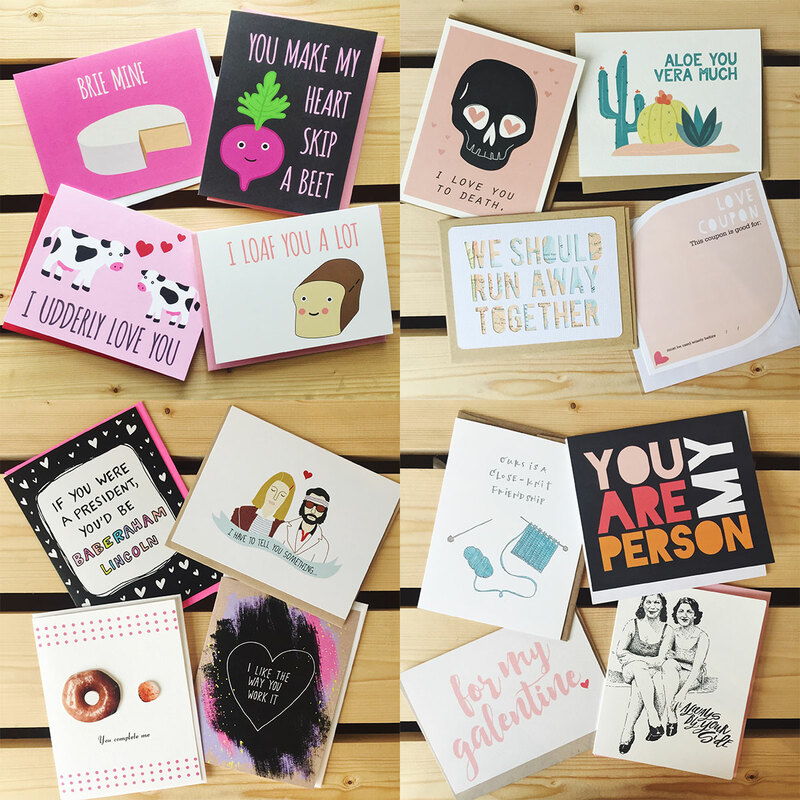 We have something for the kiddo, SO, Galentine, or whoever is your Valentine this year! 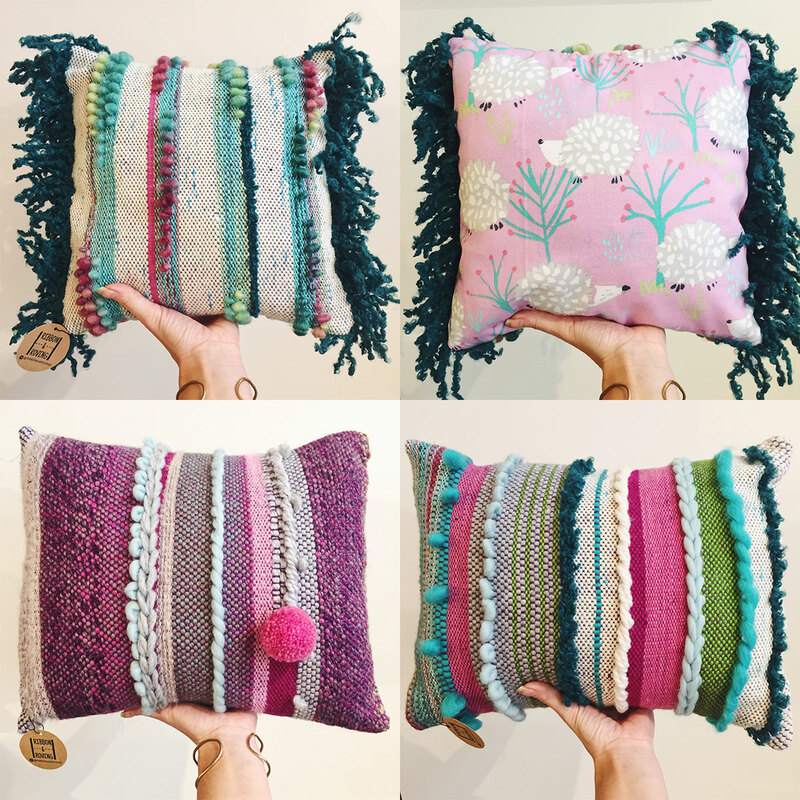 Our first Crafternoon may already be sold out, but have no fear as we’ll be trying to offer trendy DIY classes like this one every second Saturday! 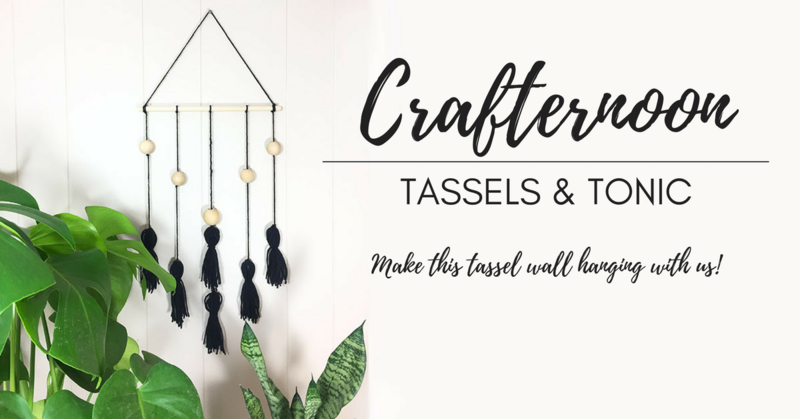 These crafts will be less involved than our traditional workshops, but they’ll still send you home with a trendy, completed project! All supplies will be included for every class! Be on the lookout for the next one in April! 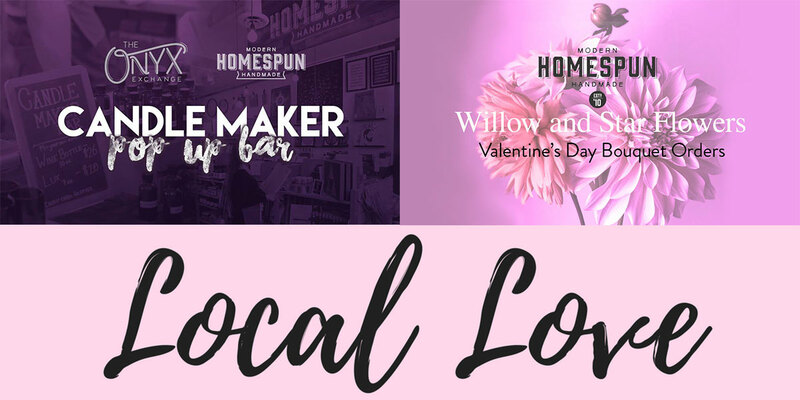 The Local Love Event is TODAY Sunday, February 11th from 1pm – 4pm in store! This Valentine’s Day, spread the Local Love! We’ll be featuring a candle-maker bar with the Onyx Exchange and you’ll be able to preorder Valentine’s Day bouquets from Willow and Star Flowers all in store TODAY, Sunday, February 11, from 1-4pm! 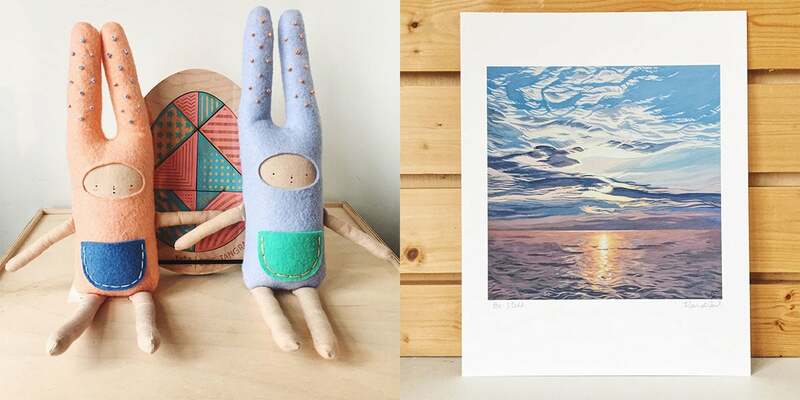 Pick up a handmade Valentine’s Day gift too from one of our 400+ makers! 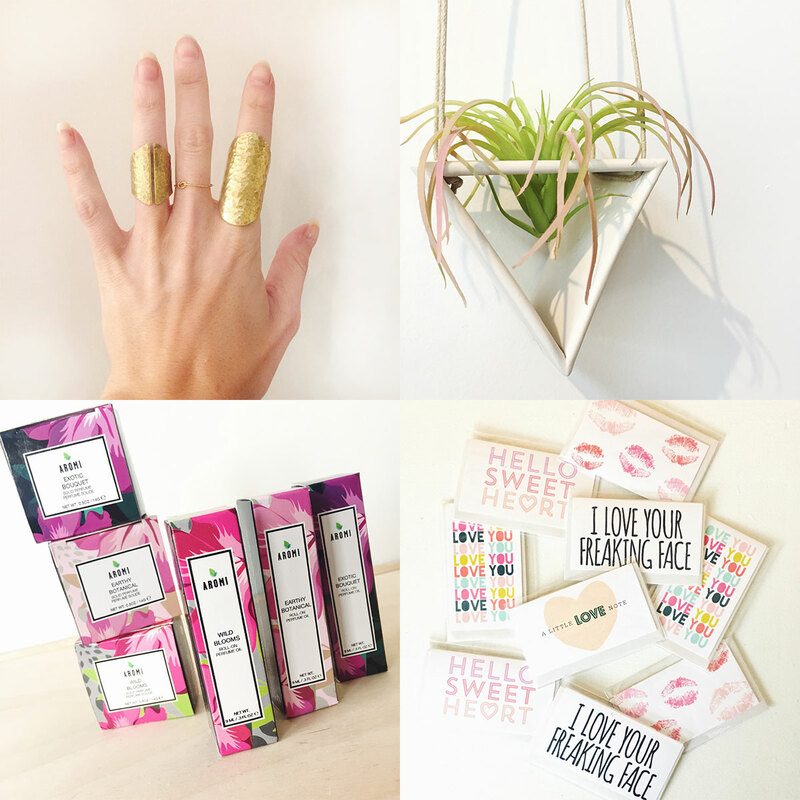 Spreading love and shopping local has never been so easy! Can’t wait to see everyone today!